Loop, the first smartphone-enabled commerce solution accepted at virtually every point-of-sale terminal, today announces it has secured more than $10 million in funding and will start shipping its mobile app and its first AppCessory, the Loop Fob, to its pre-order customers and Kickstarter backers this month. Loop has solved the biggest problem facing mobile payments to date, by delivering a mobile wallet solution accepted nearly everywhere on day one. 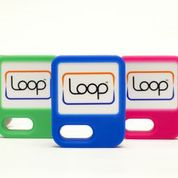 Loop’s patented invention transforms existing mag stripe readers at every point of sale terminal today, into contactless payment receivers with no change required by the merchant. This enables instant and universal acceptance for consumers to use their smartphones and smart accessories to pay at their favorite merchants, freeing them from the paper and plastic cards that clutter their wallets and their lives. Unlike solutions proposing programmable cards with limited security, memory, battery capacity, and plagued with reliability issues in the past, Loop integrates the highest level of Payment Card Industry (PCI) security, and can conveniently store hundreds of cards (payment, gift, loyalty, reward, ID, etc.). Its contactless chip does not wear out with use and fits into virtually any form factor that consumers want to carry – from smartphones to fobs, to charge cases, to smart watches, the possibilities are limitless. Loop was founded by two payment industry pioneers, Will Graylin and George Wallner, both with proven track records of delivering widely adopted payment innovations. Loop was oversubscribed its initial fund raising efforts, owing to the enthusiasm that investors have for its potential to ignite mobile payments at the physical point of sale. At $10 million, it is one of largest angel funding rounds in recent memory, and sets the stage for its Series B from strategic and institutional investors in early 2014 to fuel its growth.